TTT Books? What Books? It’s Social Media Time! Ten Bookish People You Should Follow On Twitter/Instagram/Youtube/Snapchat/Facebook — you pick the platform of your choice to talk about all the interesting bookish people to follow! If you don’t use social media much you can pick your favorite bookish blogs or new blogs you’ve come across to follow. 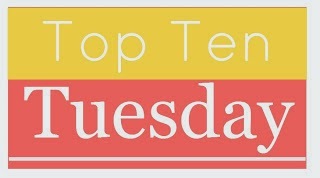 Top Ten Tuesday is taking a break this week from books to check out bookish social media instead! I will be honest, outside of my wonderful fellow book bloggers, my book-related social media mainly consists of authors and publishers. Honestly, with social media I follow a lot more TV/movie/nerd-themed stuff. (Nerd themed – think BBC Sherlock [Benedict! ], Doctor Who [David Tennant! ], Star Wars, Harry Potter, etc.) I will also say I’m not super active on Twitter, but I have found that it is a great space to connect directly with authors. I follow loads of book related things on Pinterest, but not one in particular to specifically call out here. You can check out my book lovin’ board, Why Yes, I am a Bibliophile to see all of my bookish goodness going on over on Pinterest. Wil Wheaton http://wilwheaton.net/ – Along with Wil’s page you can find links to his Tumblr, Twitter, and Facebook. Jenny Lawson http://thebloggess.com/ – Jenny has links to Twitter, Instagram, Facebook, and Pinterest. Henery Press https://www.facebook.com/HeneryPress/ – This publisher is amazing with giveaways! OwlCrate https://www.facebook.com/OwlCrate/ – I signed up for their subscription service in January, and I am loving it! I need to do a post on my boxes, hopefully next week. What about you? What bookish social media sites do you like to keep up with? Let me know what I’m missing out on outside of your wonderful bookish blogs! Link up to your own TTT if you’ve got one. ← How can you read that? I’m seriously considering signing up for Owl Crate….